I was perusing HGTV.com, hoping to find ideas or inspiration to utilize floor space in a kid’s room for playing, while still providing bedroom functionality. I had reservations as to what benefit I would find because most of these professional/corporate sites have amazing and beautiful pictures, but the project designs are not easily duplicated without a budget just as equally amazing, or an already impressive floor plan. I found two potentially promising galleries: “Jaw-Dropping Indoor Playspaces for Kids of All Ages” and “Small Space Decorating: Shared Kids’ Room and Storage Ideas” (click the gallery titles to be see HGTV’s full content). 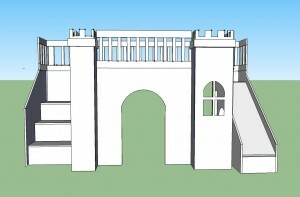 Unfortunately, I couldn’t find anything on that site combining the two ideas: small indoor play spaces, but alas. The latter gallery didn’t provide much help—it was mostly about how to make room décor double as being both functional and aesthetic, but luckily the former gallery was a little more useful. 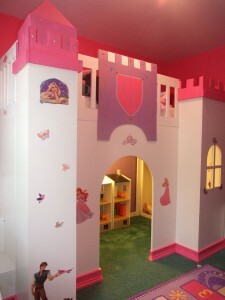 Yes, most of the “jaw-dropping” playspaces are jaw-dropping—these are for people who have entire rooms in their houses that they can dedicate to turn into a basketball court or an arcade/movie theater room, not for people trying to give maximum purpose to a tiny 9’x12’ room in an apartment. The other limitation that “extreme make-over” sites don’t have is the inability to permanently change or alter the room physically/structurally. 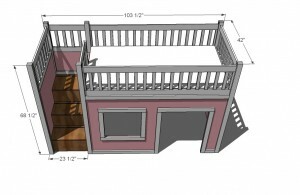 But, as I alluded to before, even this grandiose gallery still gave me a bit of help, and that’s in the notion of building up if you can’t build out: the loft bed. 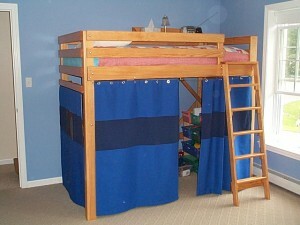 The loft bed is not a simple undertaking or cheap way of sprucing up a room—it is somewhat of an investment of time, energy, and money. At the same time, it is probably the single most significant way to 1. utilize space without eliminating functionality, 2. create a unique and creative indoor play area, and 3. not look tacky, cluttered, or overdone. 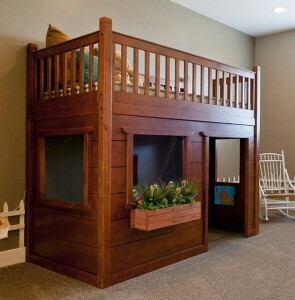 Also, this set-up can be purposeful from early age (crib/toddler bed can be kept in the bottom portion) until your child moves out, and the design can be modified or updated through the years to change with your child’s interests (or a classic exterior like the wood shown below will look great forever!). 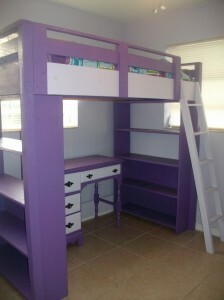 In the style of college loft beds, the bottom area can later be converted into a desk or entertainment area, making this creation limitless in possibilities and functions. 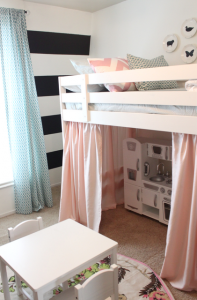 I found more examples of the loft bed at Houzz.com– here’s an example of how this concept is versatile by using the bottom portion for the bed and the upper portion is turned into the play area. While it’s not exactly a bunk bed or loft structure anymore, it follows the same concept of taking advantage of ABOVE space to give the room additional usability. 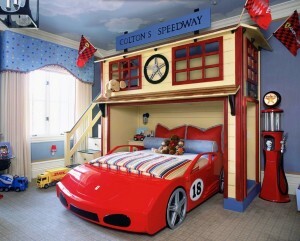 I’m more a fan of the former examples as they are more compact, but I do want to point out how this speedway themed bedroom uses the staircase as inclusive storage space. 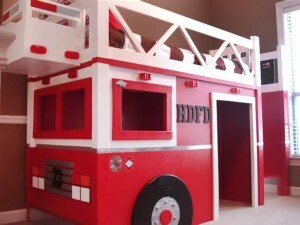 A staircase takes more space than a ladder, but is more conducive to younger kids (from what I can see in the pictures, the Fire Truck also has a staircase, but the Classic Wood most likely has a ladder). Parents may also be more comfortable with the bed being at a closer proximity to the floor, especially with small children. For those who are interested in a DIY project, a little craftsmanship can complete the below basic loft structure for less than $100. 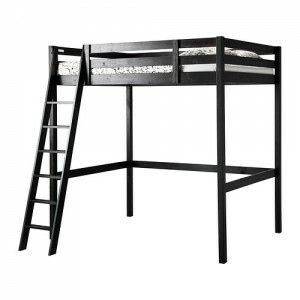 This exact model is available (at the time of writing) for $299 at Ikea.com (click on the picture to go directly to Ikea.com). 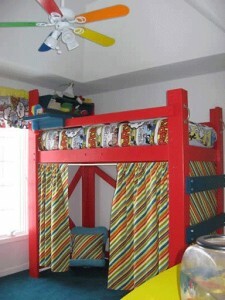 Even a simple structure spruced up with creative painting can turn an ordinary bed into a room worth showing off. Though it’s not being used as a loft, this example shows how paint can make a big difference even if you stick to the basic frame. 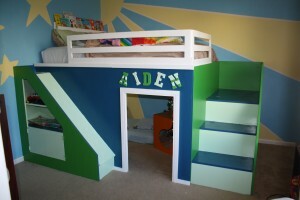 Playhouse Loft Bed, with storage-stairs: Click pictures to see plans at ana-white.com. I love this boy’s version! Complete with slide and clubhouse. 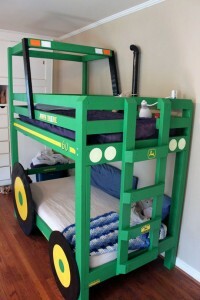 Ana White also has plans for the Fire Truck bed from the Part I of this post!